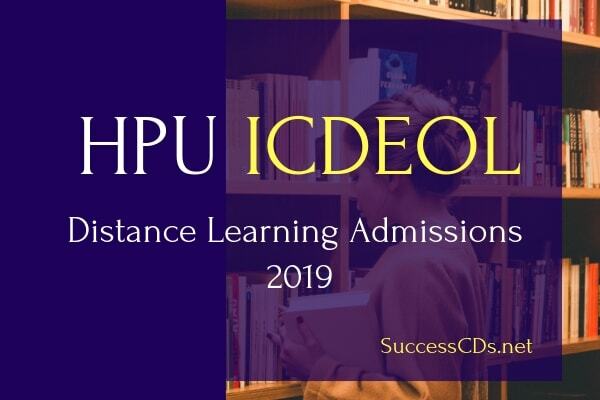 Candidates can check complete information about HPU ICDEOL Admission 2019 like important dates, eligibility criteria, application form, etc on this page below. Himachal Pradesh University is considered as a pioneer in the field of distance education in India. HP University holds the credit of being the first such institution in the country to offer master degree programs in arts, commerce and science. The most distinctive feature of HP University's International Centre for Distance Education and Open Learning (ICDEOL) remains its adaptability to the changing need of the times. The university has 12 faculties and 30 teaching departments, and it continues to follow multimedia approach for imparting education. For admission in International Centre for Distance Education and Open Learning (ICDEOL) for following Courses/ Degree for the academic session 2019-20. For Undergraduate Courses: Candidates should have a Bachelor's degree in any discipline with 50% (45% for SC/ST) of marks from a recognised University. For all the courses, eligibility details, kindly refer the prospectus and visit the website www.hpuniv.in; www.hpuniv.nic.in or www.icdeolhpu.org. The admission process for above courses, shall be online. The desirous applicants can apply through official website of ICDEOL i.e. www.icdeonline.org OR www.hpuniv.ac.in and directly linking to https://admission.hpushimla.in. The Prospectus for the Academic Session 2019-20 shall be available on the above website, hence eligible candidates are advised to visit the above websites to apply online accordingly. Further, the prospectus can also be downloaded from website www.icdeolhpu.org.